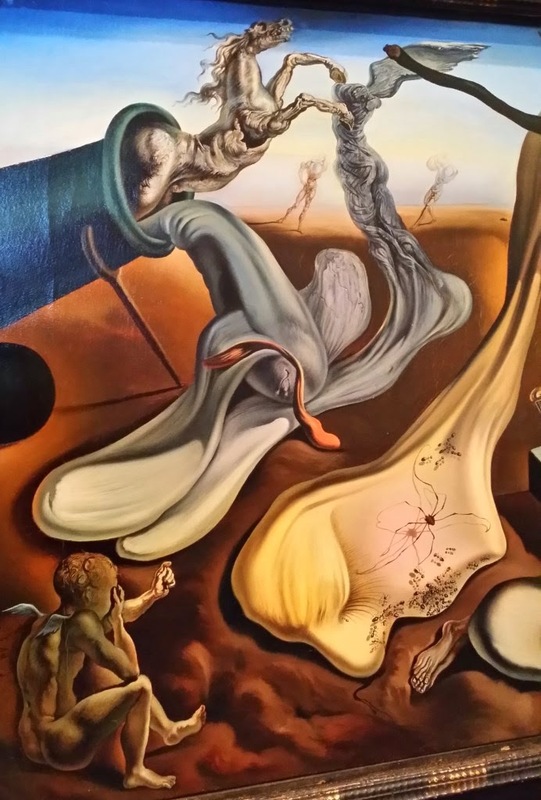 For those who love Salvador Dalí and Pablo Picasso as much as this blogger, the time is now to book a flight or plan a road trip to St. Petersburg, Fla. 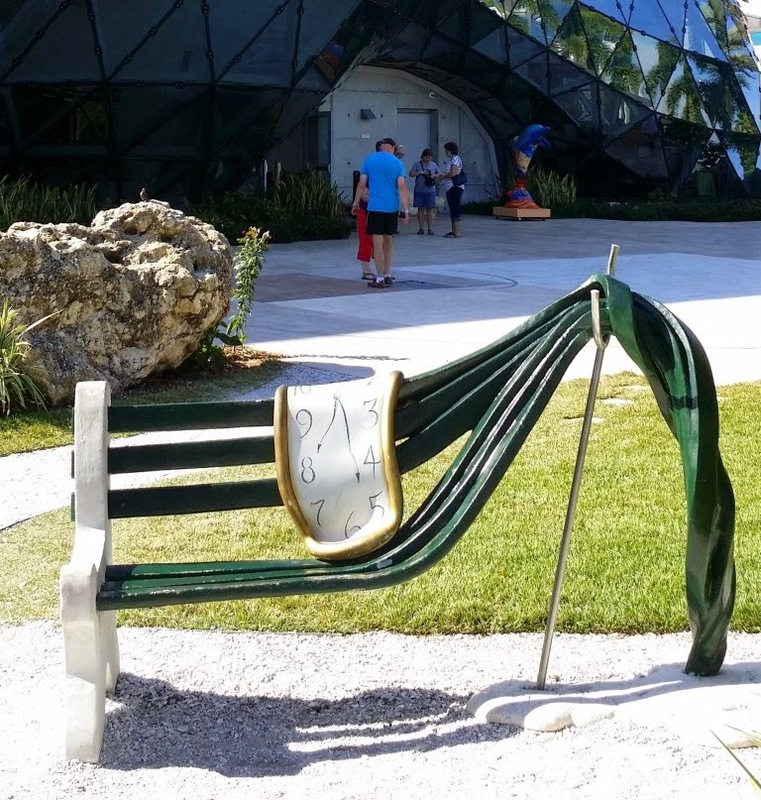 The Dalí Museum in The Sunshine City recently opened a new blockbuster exhibition "Picasso/Dalí, Dalí/Picasso" which was well worth a special day trip across Florida while in Orlando for work. I likely would have driven from Atlanta for this one -- spectacular! 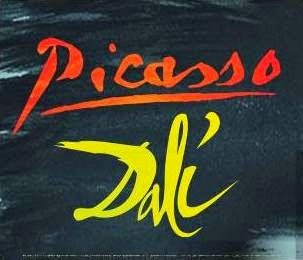 Featuring an assemblage of more than 90 items from 20 international museums and private collections, the Picasso:Dalí exhibition showcases how the two artists -- professional acquaintances and mutual admirers for 30+ years -- found inspiration or potential influence in each other's work. 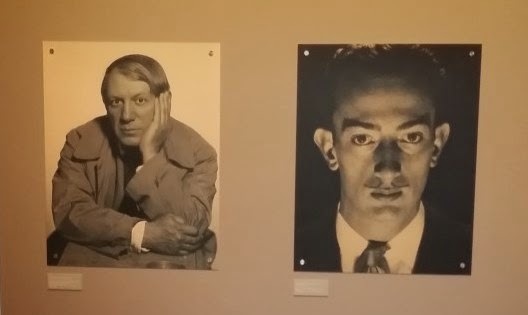 The exhibition gallery entrance welcomes visitors with a pair of black and white photograph portraits of the artists, setting the tone for several side-by-side canvas (or other object) placements, as pleasant for the eyes as a expertly paired wine and charcuterie plate for the palate. 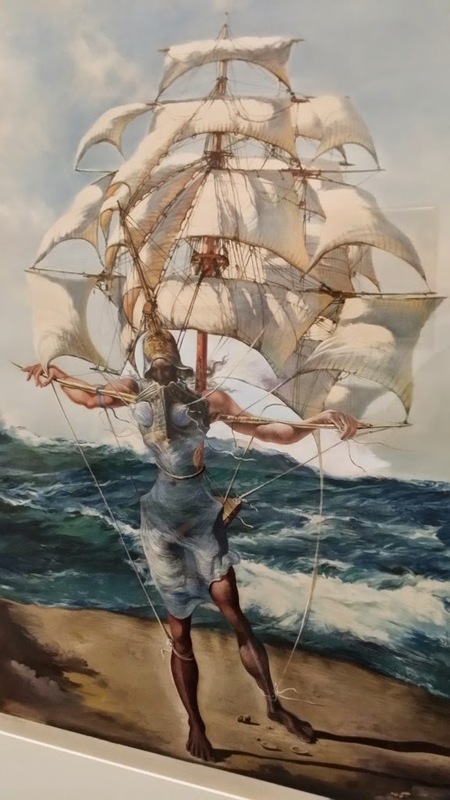 Since photography is not allowed in the galleries, many of the images (some paired, most not) in this post are corralled from the Internet or the 250-page full-color exhibition catalog (a good read). 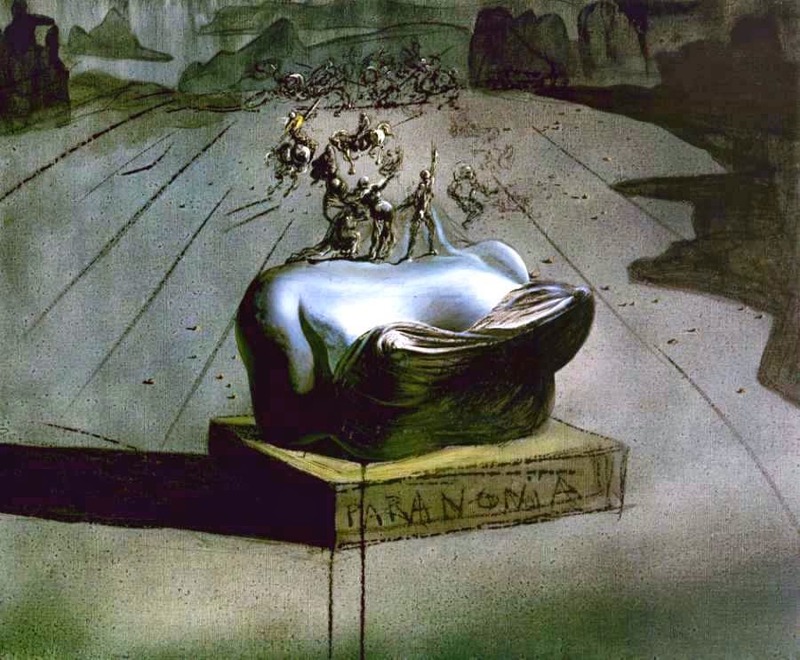 For instance, both artists created depictions of female nudes bathing at the sea, motherly women in profile, self-portraits (and many images of their patrons), still-lifes, Spanish Civil War symbolism and influential women such as their wives and, in Dalí's case, his sister, whose double image gazes like a playing card. 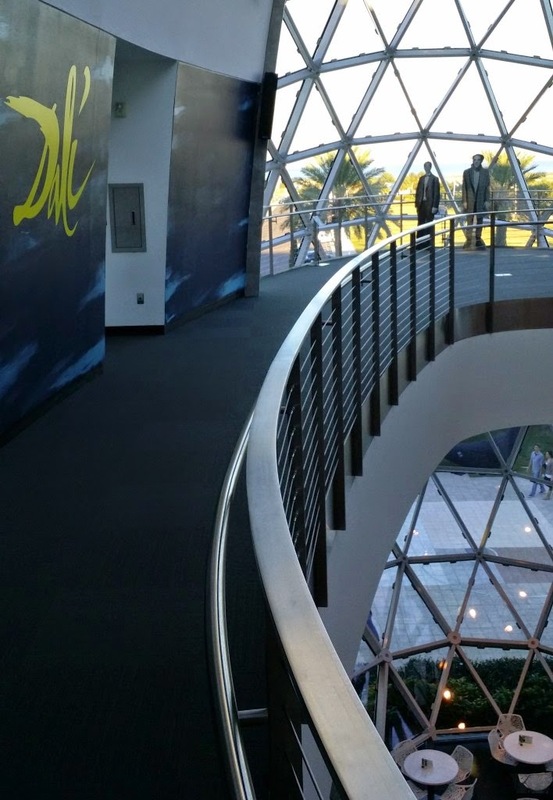 I found the paired-for-comparison works as home runs around every corner of the third floor presentation. 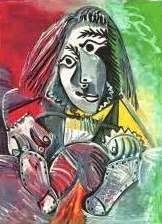 Also enjoyed reading Salvador's "Dalí News" newspaper with screaming headlines and reference to his own portrait of Picasso. 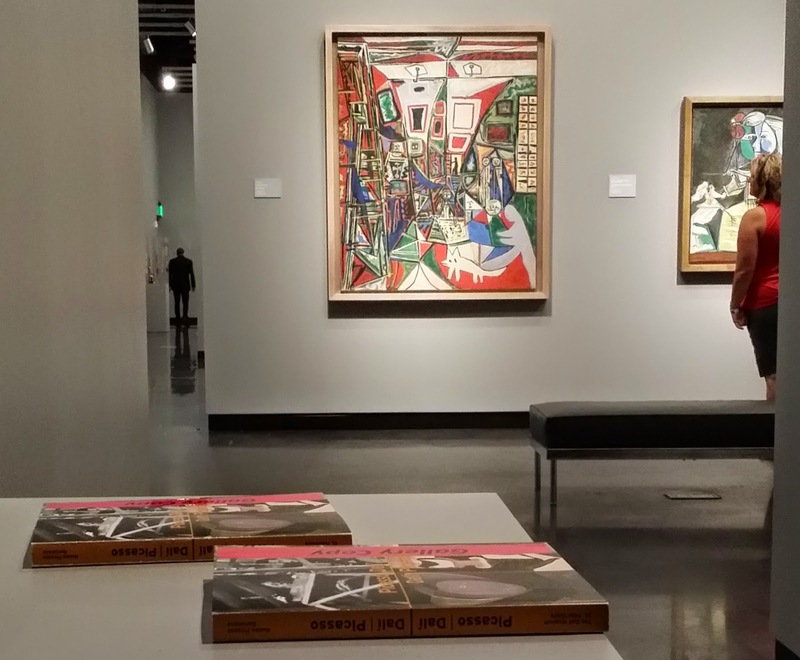 Several other publication samples -- original magazine features, exhibition programs and books -- are showcased throughout the exhibition. 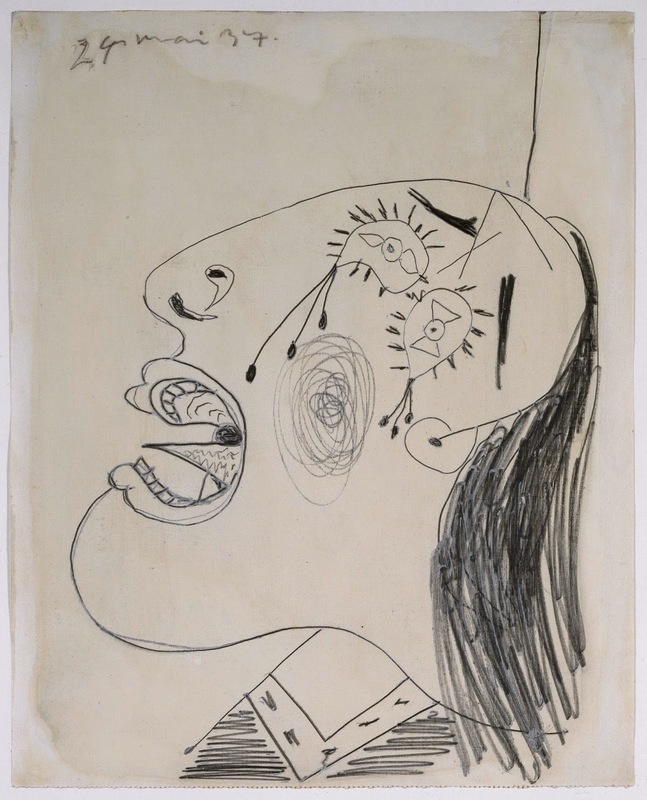 There are numerous drawings by both masters, once again mirroring themes. 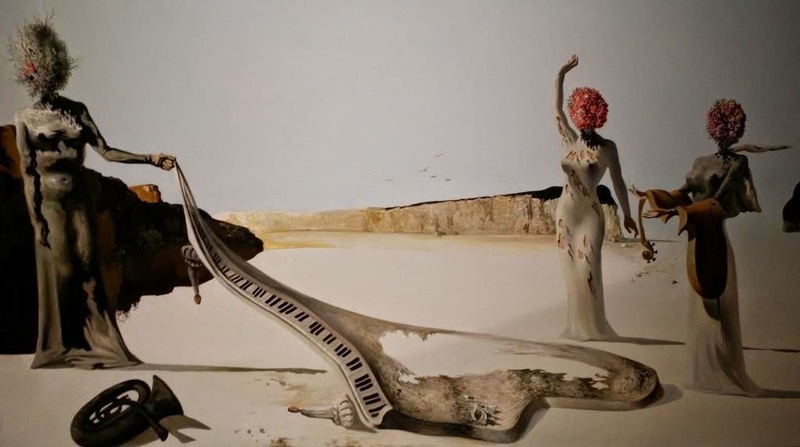 A few items in the exhibition resonated as "stand alone" items for either artist. 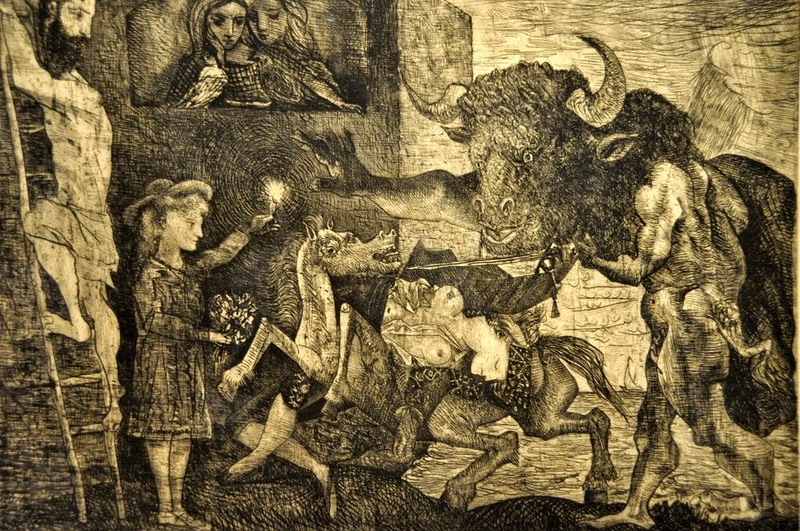 Picasso's "Minotauromachy" (a 1934 etching from the Museum of Modern Art) and the extra large canvas "Las Meninas" (from Museo Picasso) are favorites. 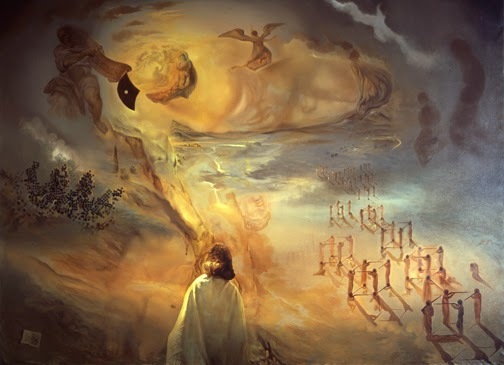 I later learned this enormous canvas is one of 58 created by the artist as influenced by the original by Diego Velázquez. 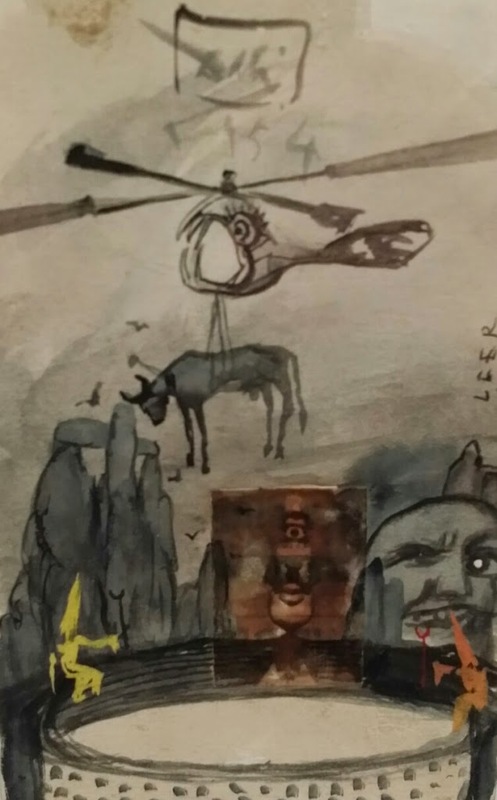 This colorful version, with a dog like figure in its foreground, also reminds me of a fourth Spanish artist, Javier Mariscal, and his creation "COBI" as mascot for the 1992 Barcelona Olympics (to what extent was Mariscal influenced by these works, I now wonder). 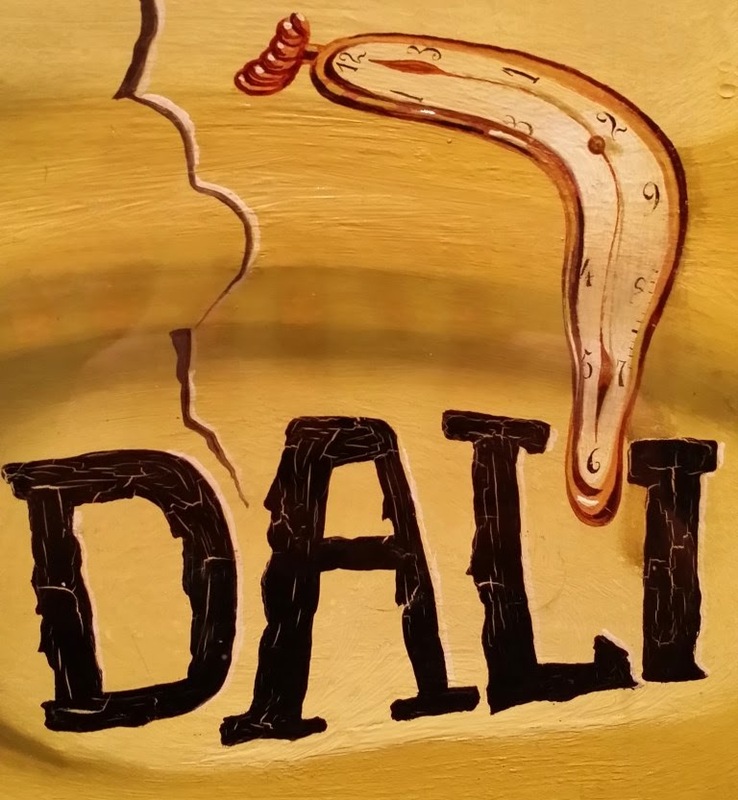 The Dalí "Portrait of Pablo" stunned me as did his "Profanation of the Host." 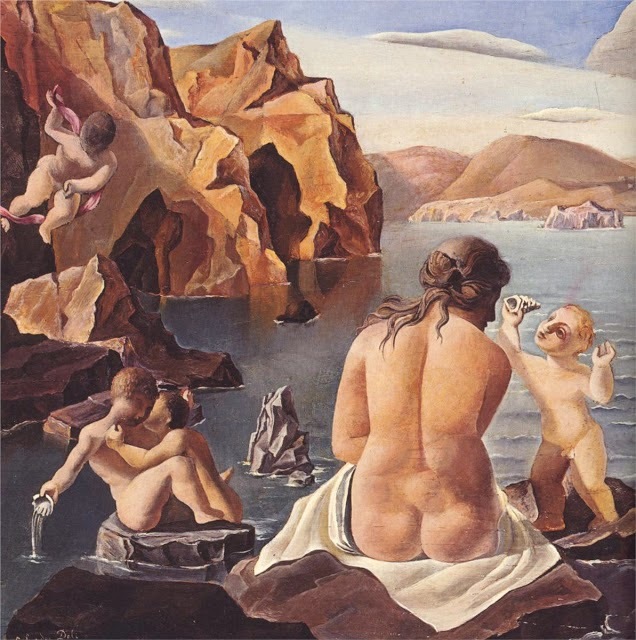 But the biggest Salvador surprise was the pre-surrealism "Venus and Cupids" (1925) with its conch-holding bather. 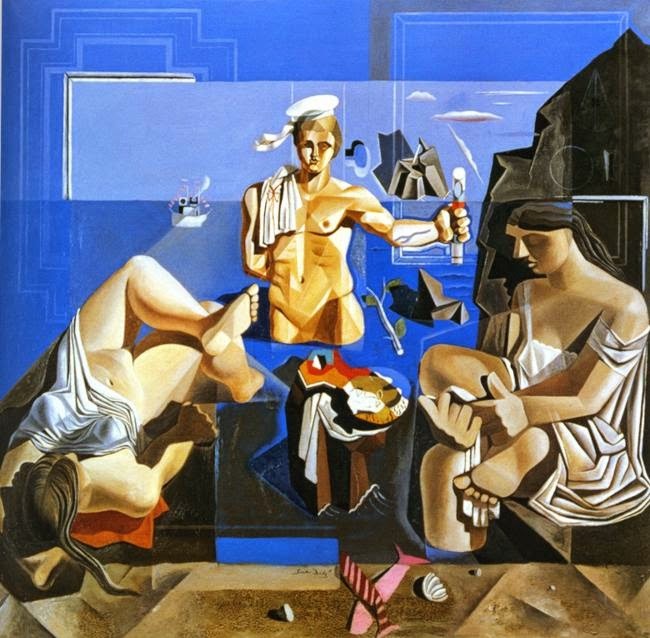 His enormous "Neo-Cubist Academy" may leave some chirping, "Hey, Sailor!" 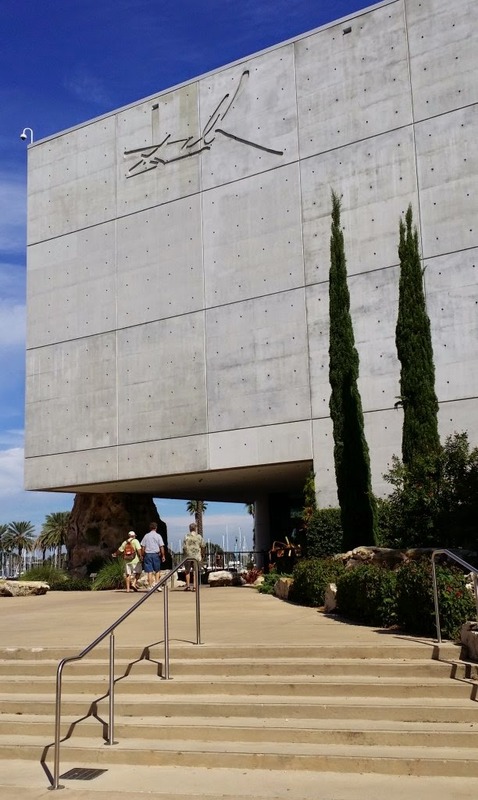 In addition to "Picasso/Dalí, Dalí/Picasso" the museum offers a dazzling array of permanent collection works, splendid architectural features (a sky-lit spiral staircase of three levels), outdoor sculpture (including a "melting" bench with droopy clock) and flora reminiscent of Catalonia. In the collection gallery I spent a lot of time studying each item on view before snapping a collage of close-up photos (some posted below). 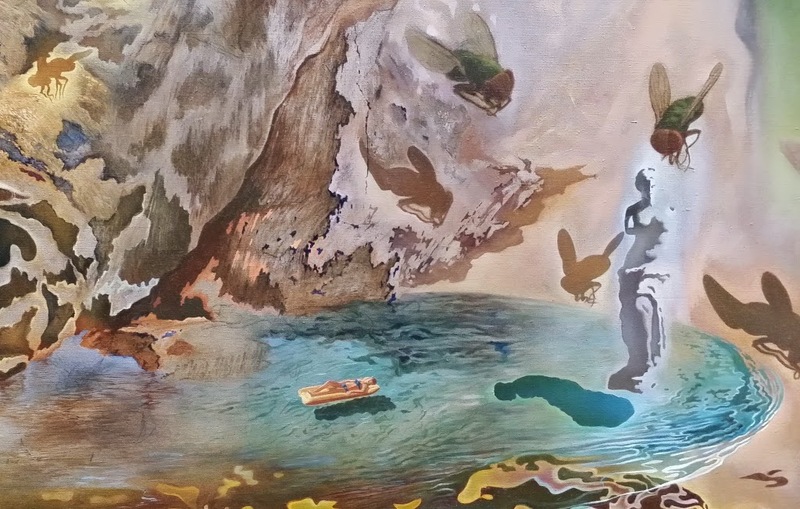 This was the first time to find so many Dalí watercolors in one place. 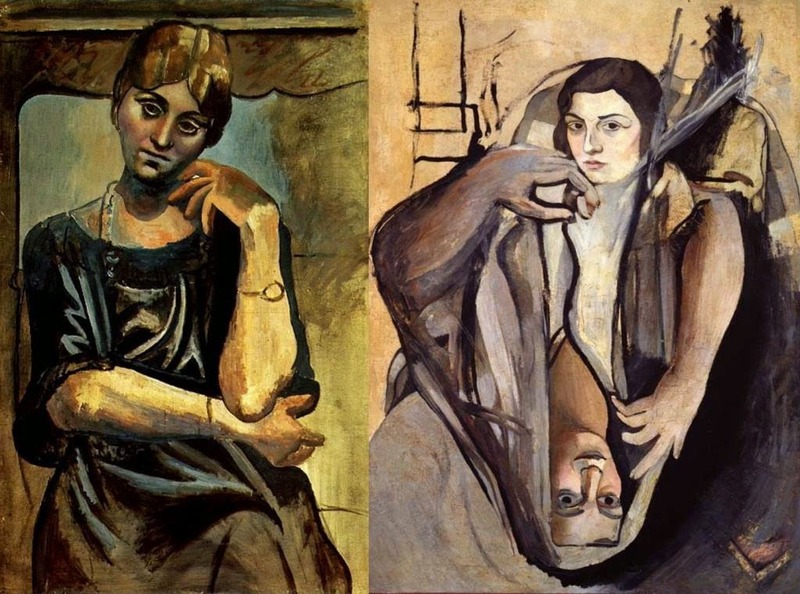 Though my eyes soaked in most of the currently-mounted paintings on a previous visit to St. Pete, and again when the museum loaned many items to Atlanta's High Museum of Art for "Dalí: The Late Work" (reviewed in two prior posts), I loved getting reacquainted with several favorites while learning about a few new-to-me paintings. 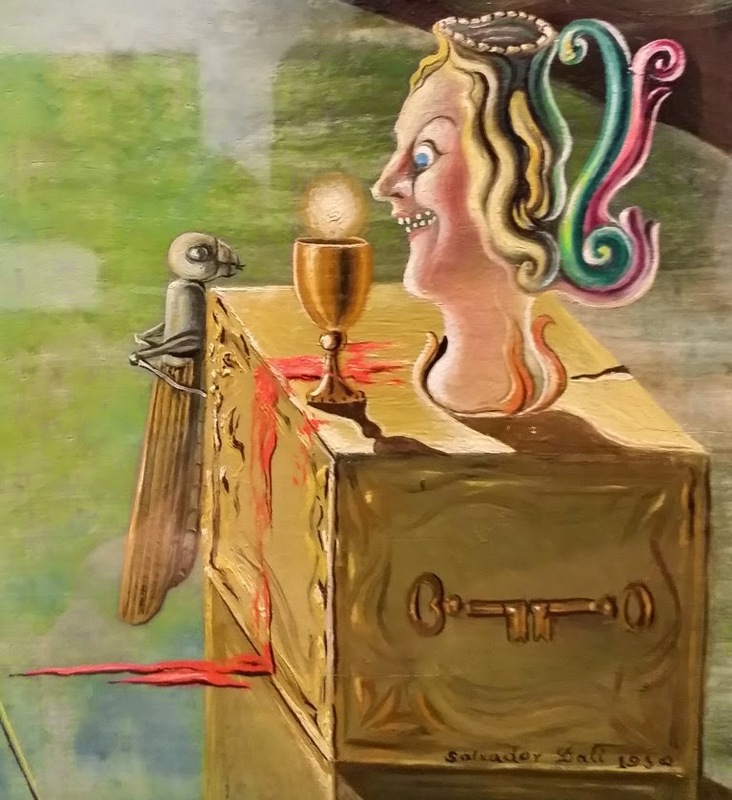 commentary on nuclear energy with "God" taking the form of a mushroom cloud extended before the gaze of Madonna (portrayed by Dalí's wife, Gala). Love the Minute Men-like molecules with a rifle bead on one another. Reminded me of an all-time great with a family back story, also on view. 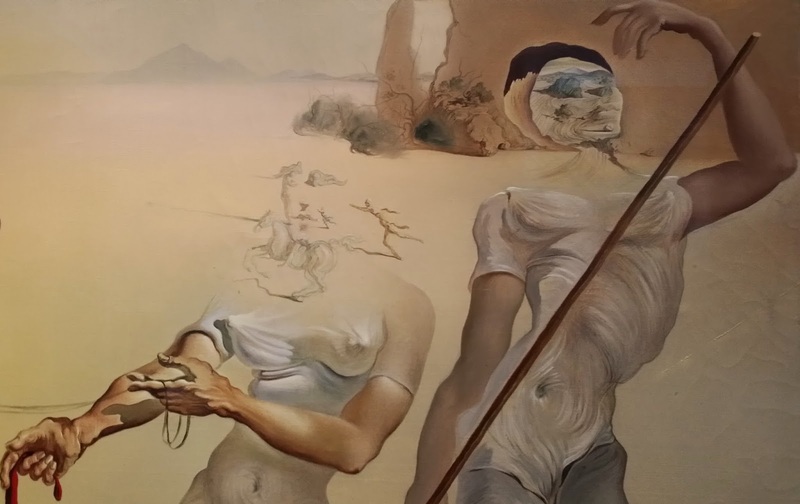 Please accept this strong recommendation to trek to The Dalí Museum in time for the current special exhibition on view through Feb. 16, 2015. Enjoy! 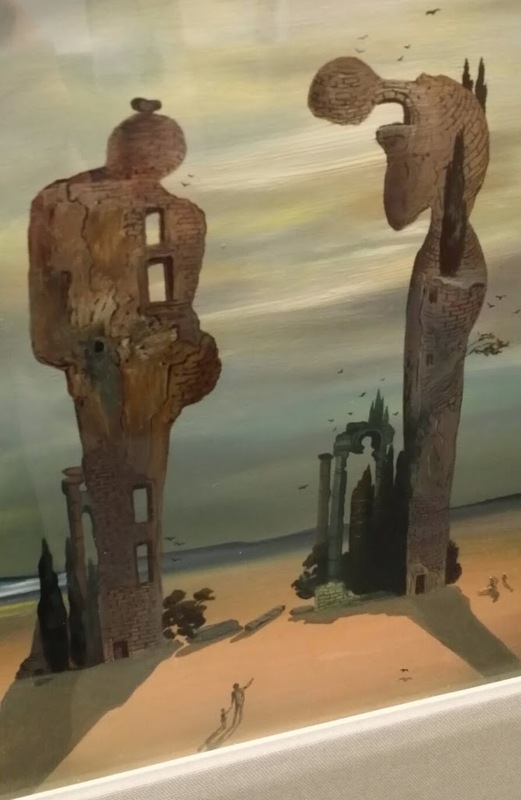 Images via The Dalí Museum, the "Picasso/Dalí, Dalí Picasso" catalog and numerous image sites including WikiArt, this site, this site , this one, that one and one more here. 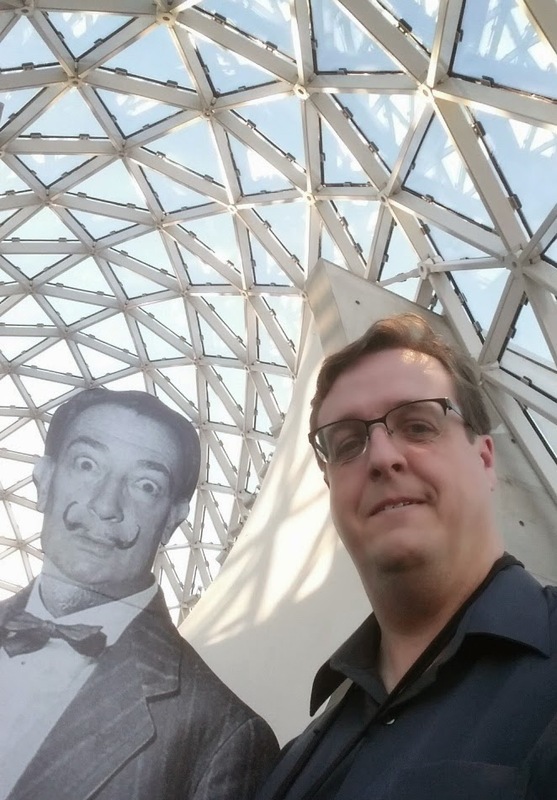 Selfie and outdoor images of The Dalí Museum by Nicholas Wolaver. All images are copyrighted and presented for reference only.